[S629] Louise Hand Harris, electronic mail to Roger Bartlett, 20 Sep 2001. [S105] The Callaway Journal, vol. 19, p. 32 (1994) (spelling her first name as Elenor). [S105] The Callaway Journal, vol. 19, p. 32 (1994) (indicating that Theodore Hicks was his father). [S105] The Callaway Journal, vol. 19, p. 32 (1994) (indicating that Theodore Hicks was her father). [S105] The Callaway Journal, vol. 19, p. 32 (1994) (naming Elenor Callaway as his mother). [S629] Louise Hand Harris, electronic mail to Roger Bartlett, 20 Sep 2001, (naming Eleanor Callaway as his mother). [S105] The Callaway Journal, vol. 19, p. 32 (1994) (giving his name as Raymond C. Hicks and giving only the place). [S105] The Callaway Journal, vol. 19, p. 32 (1994) (naming Elenor Callaway as her mother). [S629] Louise Hand Harris, electronic mail to Roger Bartlett, 20 Sep 2001, (naming Eleanor Callaway as her mother). [S105] The Callaway Journal, vol. 19, p. 32 (1994) (giving only the place). [S312] Social Security Death Index, online at http://tinyurl.com/AncestrySSDI, viewed on 22 Sep 2001 (giving only the date). [S629] Louise Hand Harris, electronic mail to Roger Bartlett, 20 Sep 2001, (giving only the date). [S675] Hand Cemetery, online ftp://ftp.rootsweb.com/pub/usgenweb/ar/baxter/cemetery/hand.txt, (giving only the year and not naming the place). [S105] The Callaway Journal, vol. 19, p. 32 (1994) (spelling his first name as Earnest and not giving the date or place). [S675] Hand Cemetery, online, above, (giving only the date). [S312] Social Security Death Index, online at http://tinyurl.com/AncestrySSDI, viewed on 22 Sep 2001. [S675] Hand Cemetery, online, above. [S675] Hand Cemetery, online ftp://ftp.rootsweb.com/pub/usgenweb/ar/baxter/cemetery/hand.txt, (giving only the year). [S312] Social Security Death Index, online at http://tinyurl.com/AncestrySSDI, viewed on 29 Sep 2001. [S312] Social Security Death Index, online at http://tinyurl.com/AncestrySSDI, viewed on 29 Sep 2001 (not naming the place of death but stating that he lived in West Plains, Mo. when he died and that last benefits were sent to an address in West Plains, Mo.). [S674] Louise Hand Harris, electronic mail to Roger Bartlett, 28 Sep 2001. [S105] The Callaway Journal, vol. 19, p. 32 (1994). [S675] Hand Cemetery, online ftp://ftp.rootsweb.com/pub/usgenweb/ar/baxter/cemetery/hand.txt, (giving only the date). [S312] Social Security Death Index, online at http://tinyurl.com/AncestrySSDI, viewed on 29 Sep 2001 (giving her name as Camma Langston and giving only the date). [S105] The Callaway Journal, vol. 19, p. 32 (1994) (giving his name as Owen Langston). [S312] Social Security Death Index, online at http://tinyurl.com/AncestrySSDI, viewed on 29 Sep 2001 (giving her name as Camma Langston; not naming the place of death but stating that she lived in West Owasso, Okla. when she died). [S675] Hand Cemetery, online ftp://ftp.rootsweb.com/pub/usgenweb/ar/baxter/cemetery/hand.txt. [S312] Social Security Death Index, online at http://tinyurl.com/AncestrySSDI, viewed on 29 Sep 2001 (stating that he died in May 1986; not naming the place of death but stating that he lived in West Plains, Mo. when he died). [S312] Social Security Death Index, online at http://tinyurl.com/AncestrySSDI, viewed on 29 Sep 2001 (stating that he died in Aug 1982; not naming the place of death but stating that he lived in West Plains, Mo. when he died and that last benefits were sent to an address in West Plains, Mo.). Birth*: He was born on 12 February 1914 in Baxter County, Arkansas. Death*: He died on 21 September 1990 in Durant, Bryan County, Oklahoma, at age 76. [S105] The Callaway Journal, vol. 19, p. 33 (1994) (naming William Edward Stephen Callaway as his father). [S105] The Callaway Journal, vol. 19, p. 33 (1994). [S105] The Callaway Journal, vol. 19, p. 36 (1994) (including his picture and naming Jackson Callaway as his father). [S105] The Callaway Journal, vol. 19, p. 36 (1994). [S105] The Callaway Journal, vol. 19, p. 18 (1994) (naming Noble Callaway as his father). [S411] Biography of Noble Callaway, online http://www.starbase21.com/kybiog/bourbon/callaway.n.txt, viewed on 11 Apr 1998, citing History of Lawrence, Orange and Washington Counties, Indiana from the Earliest Time to the Present (Chicago, Ill.: Goodspeed Bros. & Co., 1884), (naming Noble Callaway as his father). [S411] Biography of Noble Callaway, above, (naming Martha K. Nicholson as his mother). [S105] The Callaway Journal, vol. 19, p. 18 (1994) (naming Lewis Callaway as his father). Marriage*: She married Lewis Callaway, son of Noble Callaway and Martha Catherine Nicholson. 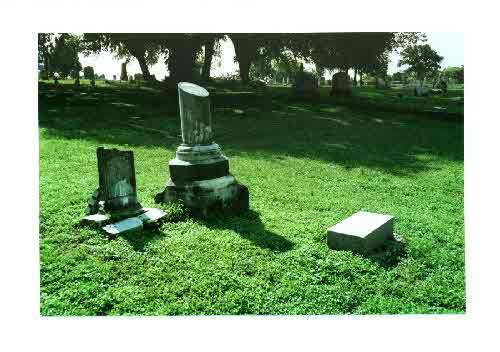 Allie Millett's tombstone (left) beside her father's, Riverside Cemetery, Seguin, Tex. Other Names*: Almira Millett, Allie Millett. Note*: • A family history gives 23 Oct 1852 as her date of death. [S199] Supposition as to father's identity, based on her grave marker being next to that of Samuel Millett. [S449] Undated notes, "Millett and Lane Family History" folder, box 2.325/F50, Millett (Tex.) Collection, Center for American History, University of Texas, Austin, Tex. (naming Samuel L. Millett as her father). [S453] Transcript of newspaper article, "Samuel Millett: San Jacinto Veteran," "Millett and Lane Family History" folder, box 2.325/F50, Millett (Tex.) Collection, Center for American History, University of Texas, Austin, Tex. (giving her name as Allie and indicating that Samuel Millett was her father). [S961] Find A Grave, online at http://www.findagrave.com, memorial for Almira E. Millett, memorial no. 58594498, viewed on 2 Oct 2013 (naming Samuel L. Millett as her father). [S449] Undated notes, "Millett and Lane Family History" folder, above (naming Clementine Bartlett as her mother). [S453] Transcript of newspaper article, "Samuel Millett: San Jacinto Veteran," "Millett and Lane Family History" folder, above (giving her name as Allie and indicating that Clementine Bartlett was her mother). [S121] Grave marker, Riverside Cemetery, Seguin, Texas (giving the date but not the place). [S449] Undated notes, "Millett and Lane Family History" folder, above (giving the date but not the place). [S961] Find A Grave, online, above, memorial for Almira E. Millett, memorial no. 58594498, viewed on 2 Oct 2013 (giving the date but not the place). [S1368] Floyd Benjamin Streeter, Longhorns [and] Shorthorns: The Life and Times of Captain Eugene Bartlett Millett, a Cattleman of the Old West (n.p. : n.pub., n.date), p. 28 (giving her name as Allmire). This material is a typescript believed to have been prepared in the 1940s and is in the Kenneth Spencer Research Library of The University of Kansas Libraries, Lawrence, Kan.
[S121] Grave marker, Riverside Cemetery, Seguin, Texas. [S961] Find A Grave, online, above, memorial for Almira E. Millett, memorial no. 58594498, viewed on 2 Oct 2013. [S449] Undated notes, "Millett and Lane Family History" folder, above (first bullet). [S1368] Floyd Benjamin Streeter, Longhorns [and] Shorthorns: The Life and Times of Captain Eugene Bartlett Millett, a Cattleman of the Old West, above, p. 28 (second bullet). [S105] The Callaway Journal, vol. 19, p. 38 (1994) (will of Chesley Callaway, naming Stephen Callaway as his son) (citing to Will Book B, p. 28, Lincoln Co., Mo.). [S266] Alice White Foster, "Callaway Pioneers in Missouri," The Callaway Journal, vol. 10, p. 35 (1985), p. 37 (naming Chesley Callaway, Jr. as his father). [S266] Alice White Foster, "Callaway Pioneers in Missouri," above, p. 37 (naming Elizabeth Gilbert as his mother). [S266] Alice White Foster, "Callaway Pioneers in Missouri," above, p. 37 (giving the date as 6 Sep 1879, which presumably whould be 1819). [S266] Alice White Foster, "Callaway Pioneers in Missouri," above, p. 37. [S266] Alice White Foster, "Callaway Pioneers in Missouri," above, p. 37 (naming Stephen Robert Callaway as his father). [S266] Alice White Foster, "Callaway Pioneers in Missouri," above, p. 37 (naming Stephen Robert Callaway as her father). [S266] Alice White Foster, "Callaway Pioneers in Missouri," above, p. 37 (naming Stephen Robert Callaway as this child's father). [S105] The Callaway Journal, vol. 19, p. 38 (1994) (will of Chesley Callaway, naming William Callaway as his son) (citing to Will Book B, p. 28, Lincoln Co., Mo.). [S105] The Callaway Journal, vol. 19, p. 37 (1994) (naming Chesley Callaway, Sr. as his father). [S105] The Callaway Journal, vol. 19, p. 37 (1994) (indicating that Christina (Galloway) Callaway was his mother). [S105] The Callaway Journal, vol. 19, p. 37 (1994) (citing to Missouri Republican, St. Louis, Mo., 27 Sep 1827, p. 2, col. 1). [S105] The Callaway Journal, vol. 19, p. 37 (1994) (naming William Callaway as his father). Marriage*: She married William Callaway, son of Chesley Callaway and Christina Galloway. [S105] The Callaway Journal, vol. 19, p. 37 (1994). [S266] Alice White Foster, "Callaway Pioneers in Missouri," The Callaway Journal, vol. 10, p. 35 (1985), pp. 35-36 (naming Zachariah Callaway, Sr. as her father). [S105] The Callaway Journal, vol. 19, pp. 38-39 (1994) (will of Jane M. Calloway [sic], naming America Collard as Jane's heir) (citing to Will Book A, pp. 20-21, Lincoln Co., Mo.). [S266] Alice White Foster, "Callaway Pioneers in Missouri," above, pp. 35-36 (naming Jane Early as her mother). [S266] Alice White Foster, "Callaway Pioneers in Missouri," above, p. 36. [S552] Bob Sander-Cederlof, electronic mail to Roger Bartlett, 2 Mar 2000. [S11] Index to Texas Death Records (Austin, Tex. : Tex. Dept. of Health, Bur. of Vital Statistics), typescript, 1903-40, vol. 10, p. 4951, file 4392 (giving her name as Mrs. A. Collard and not naming the town). [S552] Bob Sander-Cederlof, electronic mail to Roger Bartlett, 2 Mar 2000, (giving only the date). [S552] Bob Sander-Cederlof, electronic mail to Roger Bartlett, 2 Mar 2000, (naming America Callaway as her mother). [S266] Alice White Foster, "Callaway Pioneers in Missouri," above, p. 36 (naming America Callaway as his mother). [S552] Bob Sander-Cederlof, electronic mail to Roger Bartlett, 2 Mar 2000, (naming America Callaway as his mother). [S266] Alice White Foster, "Callaway Pioneers in Missouri," above, p. 36 (naming America Callaway as her mother). [S105] The Callaway Journal, vol. 19, p. 38 (1994) (will of Zachariah Calloway [sic], naming Lutitia Calloway as one of the "younger children" of his wife, Jane M. Calloway) (citing to Will Book A, pp. 20-21, Lincoln Co., Mo.). [S105] The Callaway Journal, vol. 19, pp. 38-39 (1994) (will of Jane M. Calloway [sic], naming Lutitia Calloway as Jane's heir) (citing to Will Book A, pp. 20-21, Lincoln Co., Mo.). [S266] Alice White Foster, "Callaway Pioneers in Missouri," The Callaway Journal, vol. 10, p. 35 (1985), pp. 35-36 (naming Zachariah Callaway, Sr. as his father). [S105] The Callaway Journal, vol. 19, pp. 38-39 (1994) (will of Jane M. Calloway [sic], naming Zachariah Calloway as Jane's heir) (citing to Will Book A, pp. 20-21, Lincoln Co., Mo.). [S266] Alice White Foster, "Callaway Pioneers in Missouri," above, pp. 35-36 (naming Jane Early as his mother). [S266] Alice White Foster, "Callaway Pioneers in Missouri," above, p. 36 (giving the year as 1867 but presumably meaning 1857). [S266] Alice White Foster, "Callaway Pioneers in Missouri," above, pp. 36-37 (naming Zachariah ('Butch') Callaway, Jr. as his father). [S266] Alice White Foster, "Callaway Pioneers in Missouri," above, pp. 36-37 (naming Zachariah ('Butch') Callaway, Jr. as her father). [S266] Alice White Foster, "Callaway Pioneers in Missouri," The Callaway Journal, vol. 10, p. 35 (1985), pp. 35, 37 (naming Zachariah Callaway, Sr. as his father). [S105] The Callaway Journal, vol. 19, pp. 38-39 (1994) (will of Jane M. Calloway [sic], naming John Calloway as Jane's heir) (citing to Will Book A, pp. 20-21, Lincoln Co., Mo.). [S266] Alice White Foster, "Callaway Pioneers in Missouri," above, pp. 35, 37 (naming Jane Early as his mother). [S266] Alice White Foster, "Callaway Pioneers in Missouri," above, p. 37 (naming John Callaway as her father). [S266] Alice White Foster, "Callaway Pioneers in Missouri," above, p. 37 (naming John Callaway as his father). [S266] Alice White Foster, "Callaway Pioneers in Missouri," The Callaway Journal, vol. 10, p. 35 (1985), pp. 35, 37 (naming Zachariah Callaway, Sr. as her father). [S105] The Callaway Journal, vol. 19, pp. 38-39 (1994) (will of Jane M. Calloway [sic], naming Louisiana Lynn as Jane's heir) (citing to Will Book A, pp. 20-21, Lincoln Co., Mo.). [S266] Alice White Foster, "Callaway Pioneers in Missouri," above, pp. 35, 37 (naming Jane Early as her mother). [S266] Alice White Foster, "Callaway Pioneers in Missouri," above, p. 37 (giving his name as John Watson Lyhnn). [S266] Alice White Foster, "Callaway Pioneers in Missouri," above, p. 37 (naming Louisiana Callaway as his mother). [S266] Alice White Foster, "Callaway Pioneers in Missouri," above, p. 37 (naming Louisiana Callaway as her mother). [S266] Alice White Foster, "Callaway Pioneers in Missouri," above, p. 37 ((giving his name as John S. Lyhnn and naming Louisiana Callaway as his mother). [S589] Barbara Gussman, electronic mail to Roger Bartlett, 15 Dec 2000, (naming Louisiana Callaway as his mother). Family: Lawrence B. Sitton Jr.
[S105] The Callaway Journal, vol. 19, pp. 38-39 (1994) (will of Jane M. Calloway [sic], naming Amanda Calloway as Jane's daughter) (citing to Will Book A, pp. 20-21, Lincoln Co., Mo.). [S266] Alice White Foster, "Callaway Pioneers in Missouri," above, p. 37 (naming Amanda ('Mandy') Callaway as her mother). [S266] Alice White Foster, "Callaway Pioneers in Missouri," above, p. 37 (naming Amanda ('Mandy') Callaway as his mother). [S105] The Callaway Journal, vol. 19, pp. 38-39 (1994) (will of Jane M. Calloway [sic], naming William Calloway as Jane's son) (citing to Will Book A, pp. 20-21, Lincoln Co., Mo.). [S266] Alice White Foster, "Callaway Pioneers in Missouri," above, p. 37 (naming William Callaway as her father). [S266] Alice White Foster, "Callaway Pioneers in Missouri," above, p. 37 (naming William Callaway as his father). [S266] Alice White Foster, "Callaway Pioneers in Missouri," The Callaway Journal, vol. 10, p. 35 (1985), p. 36 (naming Zachariah Callaway, Sr. as her father). [S266] Alice White Foster, "Callaway Pioneers in Missouri," above, p. 36 (naming Phoebe Cleaver as her mother). [S266] Alice White Foster, "Callaway Pioneers in Missouri," above, p. 36 (naming Hannah Callaway as his mother, citing to 1850 census for Mo.). [S266] Alice White Foster, "Callaway Pioneers in Missouri," above, p. 36 (naming Hannah Callaway as her mother, citing to 1850 census for Mo.). [S266] Alice White Foster, "Callaway Pioneers in Missouri," The Callaway Journal, vol. 10, p. 35 (1985), p. 36. [S266] Alice White Foster, "Callaway Pioneers in Missouri," above, p. 36 (naming George Presley as his father, citing to 1850 census for Mo.). [S266] Alice White Foster, "Callaway Pioneers in Missouri," above, p. 36 (naming George Presley as her father, citing to 1850 census for Mo.). [S105] The Callaway Journal, vol. 19, p. 38 (1994) (citing to Marriage Book vol. 1, p. 9, Lincoln Co., Mo.) (stating that the marriage occurred on 31 Feb [sic] and that it was recorded on 25 Feb; presumably the marriage date was 21 Feb instead of 31 Feb). [S266] Alice White Foster, "Callaway Pioneers in Missouri," above, p. 36 (stating that the marriage occurred on 21 Feb 1828 but in Pike County, Mo.). [S266] Alice White Foster, "Callaway Pioneers in Missouri," above, p. 36 (naming Susan Callaway as his mother). [S105] The Callaway Journal, vol. 19, p. 38 (1994) (citing to Marriage Book vol. 1, p. 6, Lincoln Co., Mo.). [S266] Alice White Foster, "Callaway Pioneers in Missouri," above, p. 36 (naming Delila Callaway as his mother). [S266] Alice White Foster, "Callaway Pioneers in Missouri," above, p. 36 (naming Delila Callaway as her mother).